Hummingbirds flap their wings a blistering 12 to 80 times per second (depending on the species) when in flight. This can generate quite a bit of extra body heat, which must be dissipated somehow to prevent the birds from overheating. Now scientists think they understand a bit more about how these tiny creatures regulate body temperature. Step one: they had to capture hummingbirds (Selasphorus calliope)—in this case three males and four females caught in the vicinity of Missoula, Montana. Back at the lab, each bird had its own cage outfitted with a personal feeder to ensure the birds could thrive in captivity. Then it was time for the experiment. Each hummingbird was placed in a wind tunnel and videotaped in the infrared as they flapped away, varying the wind velocities. In this way the scientists were able to capture body heat profiles for each bird during flight. They posed the carcass “in a streamlined posture with the wings folded against its body,” and then dried it out over 48 hours, before gutting its innards “using scalpel, forceps, and a drill.” This made it possible to shove a heating element into the body cavity, the better to simulate the body heat of a living bird. The whole specimen was then mounted on a wooden sling, held in place by lead wires, and placed in the wind tunnel. Then the scientists ran two sets of tests at varying wind velocities, much like they did with the living birds: one with feathers, and one with the feathers removed from the carcass. In the end, Powers et al. found that while the hummingbird is in flight, its heat loss is limited to specific body areas—its eyes, shoulder joints, and feet—the better to thermally regulate itself. For instance, the birds’ body temperature was consistently a good eight degrees Celsius above ambient air temperature when hovering, and they usually dangled their feet in an apparent attempt to dissipate more heat. When flying forward at higher speeds, the feet were retracted, possibly to still be able to dissipate heat without sacrificing aerodynamics. Images: (top) Bartosz Budrewicz/Shutterstock. 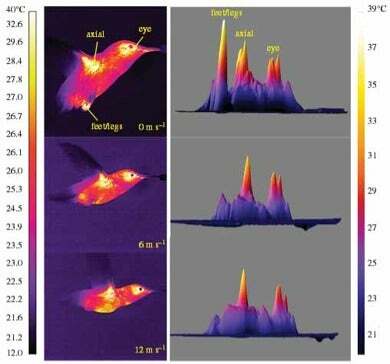 (bottom) Infrared images if hummingbirds flying in a wind tunnel (l) paired with 3D plots of surface temperature (r). D. Powers et al./George Fox University.